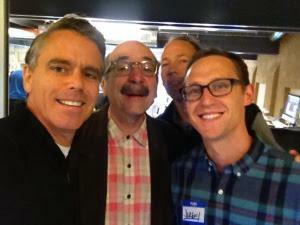 A quick selfie with David Kelley, Perry Klebahn and Jeremy Utley at the d school at Stanford University. Perhaps it’s a mentor, your children or a vision of a better future. In my life, I’m continually challenged and inspired by new experiences, and I’m happy that my time at Stanford University’s Institute of Design served up many of those. While many people in my Stanford program made a big impression on me, three in particular inspired me everyday. David Kelley, Perry Klebahn and Jeremy Utley are amazing change agents in the design-thinking world. Here are three of their many insightful teachings—they stuck to me like velcro and I hope they stay with you, too. Jeremy Utley from the d.School said this during our first session. So often in our daily lives we sit, process, plan, think, reflect, but we never quite get around to realizing, doing, and implementing. The latter are critical, of course, because we learn most effectively through doing. Since returning from Stanford I have been on a mission to share what I have learned with my senior leadership team at United Way. I could spend weeks telling them what I learned or I could challenge them to Act to Think. So, with minimal instruction, I asked each member of the team to divvy up into pairs and lead their own design projects. I know it is frustrating for some at times – we are an organization of perpetual over-achievers and perfectionists – and this messy, unknown space isn’t always comfortable. And I am sure that there are those that would have preferred a long, healthy dose of training and planning before being thrown into the “design limelight” – but in just a few short weeks the team has gone from students to teachers. We are extending these learnings beyond our four walls, as well, exploring powerful new intersections between social entrepreneurs to make an even greater impact on our communities. More on that project to come in future blog posts. Perry Klebahn, one of the co-leads of the Stanford program, said this after hearing my teammate and I describe our prototyping process among patients at the Stanford Hospital Cancer Center. One after another, patients told us they want to meet other patients with similar interests, during long hospital stays. Yet, when we arranged opportunities to connect, our patients were no-shows. “You simply aren’t pushing the boundaries enough,” Perry said. We needed new insights, so we went back to the proverbial drawing board and interviewed a patient who had been sitting in a waiting room for 20 hours. Based on this interview, we came up with an idea to connect like-minded patients via video, while they wait for their appointments. To put it mildly the reviews were mixed, but the idea opened up a whole new frontier for the design team. When I met with David Kelley, the founder of IDEO and the d.School at Stanford, he shared this insight as we discussed the role of design thinking in problem solving. David said many organizations miss major growth opportunities because they miss the underlying source of a problem or opportunity—the real issue they should be tackling. For example, Kodak invented the digital camera, but their metaphorical “water” was film: They missed the market opportunity of digital because they were swimming in film. Kelley says, “Design thinking gives us a way to reframe problems so we can discover new solutions.” In other words, design thinking helps us see not just the water we swim in, but the fishbowl as well. Do you have a quote that inspires you? Share it in the comment section.